Emily Wilska has got the holiday thing under control! She shares her last minute tips with us so that we don't go all 'crazy cakes' on our family + friends! 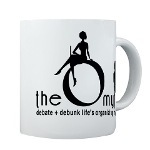 Join us weekly as we debate & debunk life's organizing myths. Get Your O Myth Gear!